In October last year I went with my department on a staff development excursion to Venice and loved every minute of being there. Venice is a truly lovely city with beautiful sights round almost every corner. To get from the airport you catch a flight boat instead of a bus. Here we are, trudging from the boat stop Zattere towards our hostel. We actually stayed in the old city in a hostel called Domus Cavanis just opposite the Hotel Belle Arti that used to be a convent of some sort. The hotel room was also spectacular. 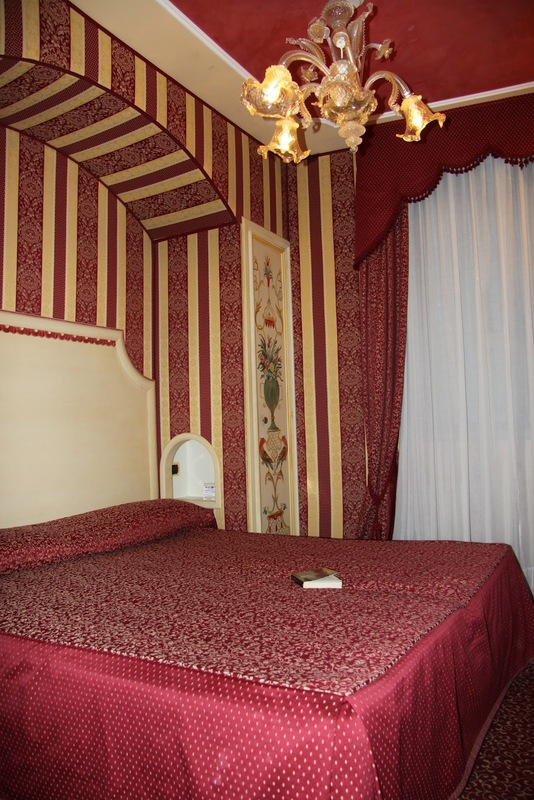 It looked like a boudoir from Casanova all in red with different patterns in gold. Being art historians we did a large number of museums and city walks guiding each other. Everyone had prepared at least one, sometimes two talks during the week. We also had attended a number of preparatory lectures at home about Venice, both by art historians as well as by scholars from other disciplines. A single blogpost is not enough to represent this tour, so over the next few days I will write some more to go with a selection of photos. Doing the wave for Zemanta!